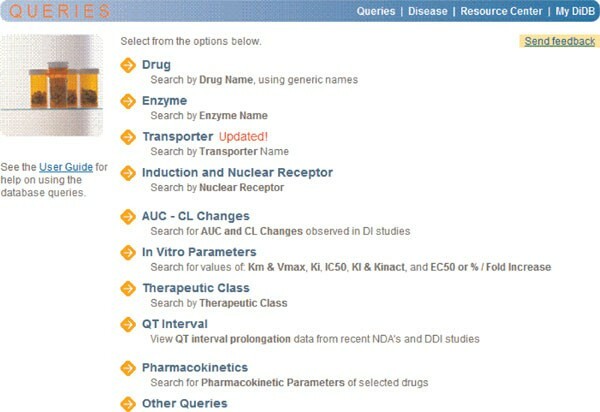 The Metabolism and Transport Drug Interaction Database (http://www.druginteractioninfo.org) is a web-based research and analysis tool developed in the Department of Pharmaceutics at the University of Washington. The database has the largest manually curated collection of data related to drug interactions in humans. The tool integrates information from the literature, public repositories, reference textbooks, guideline documents, product prescribing labels and clinical review sections of new drug approval (NDA) packages. The database's easy-to-use web portal offers tools for visualisation, reporting and filtering of information. The database helps scientists to mine kinetics information for drug-metabolising enzymes and transporters, to assess the extent of in vivo drug interaction studies, as well as case reports for drugs, therapeutic proteins, food products and herbal derivatives. This review provides a brief description of the database organisation, its search functionalities and examples of use. Adverse drug reactions (ADRs) remain one of the leading causes of morbidity and mortality in healthcare. In January 2000 the Institute of Medicine reported that between 44,000 and 98,000 deaths occur annually from medical errors in American hospitals . Of this total, an estimated 7,000 deaths occur due to ADRs. It is estimated that drug-drug interactions (DDIs) represent 3-5 per cent of all in-hospital medication errors and that they are also an important cause of patient visits to emergency departments  Among the factors that contribute to the occurrence of a DDI are patient age, number and type of concomitant medications and disease stage. In recent years, while healthcare providers have been offered access to and have benefitted from numerous drug information tools that have provided them with guidance on how drugs can be co-administered, researchers within the drug development community have had access to a more limited portfolio of data repositories. These scientists need to browse the vast literature for primary scientific data (ie datasets on metabolic isozymes, transporters, substrates, inducers, and inhibitors) that will provide them with context for their research findings and help with their drug interaction programme. The University of Washington's Metabolism and Transport Drug Interaction Database (DIDB; http://www.druginteractioninfo.org) was initially designed with extensive input from scientists from pharmaceutical companies and was tailored to their various needs. Later, the tool capabilities were expanded and its use was extended to other groups (Table 1). CRO, contract research organisation; DDI, drug-drug interaction; DMPK, drug metabolism and pharmacokinetics. The database contains in vitro and in vivo kinetics information for drug-metabolising enzymes and transporters, pharmacokinetics parameters/pharma-codynamic measures and side effects reported in clinical drug interaction studies. Each dataset integrates both the experimental design and the primary results. The database can be searched not only by main concepts in the field of drug interaction (ie drug name, enzyme, transporter, etc. ), but also by related topics such as QTc prolongation or impact of genetic variability on drug exposure in the context of a drug interaction. Even though the DIDB was initially designed for evaluation of drug interaction profiles of small molecule compounds, a new dataset related to therapeutic proteins has been added recently. The DIDB application has a typical multi-tier architecture in a Microsoft®.NET environment. (The web part of the database, which is accessed by the user over the internet, is hosted on a Microsoft Windows 2003 server running IIS and version 2.0 of the ASP.NET framework. All data are stored on a Microsoft SQL Server 2005 database.) The use of the web facilitates worldwide access, as well as upgrades and updates; the DIDB is updated daily. The current DIDB datasets are extracted from more than 8,300 published articles referenced in PubMed (from 1966 to the present), 70 new drug applications (NDAs) and 368 product labels (from 1998 to the present). The unit of information (citation) is either a published research article or the 'NDA Clinical Reviews' section available from the FDA Approved Drug Products website . Detailed records are generated from each research article or NDA, highlighting study results as well as experimental conditions. The records are structured in the database according to a defined hierarchy; for example, relevant information collected from in vitro studies pertains to the role of particular metabolic enzymes in the various metabolic pathways of substrates and the inhibition and induction spectra of drugs toward metabolic enzymes. Particular attention is paid to experimental conditions used in determination of enzyme kinetics parameters, including K m , K i , IC50, KI-Kinact and EC50. In vivo studies include pharmacokinetic studies with blood level measurements, pharmacokinetic-pharmacodynamic studies, as well as case reports. Recently, a new section analysing DDIs in the context of specific diseases and their co-morbidities (Disease-Oriented Database) was added to the DIDB. 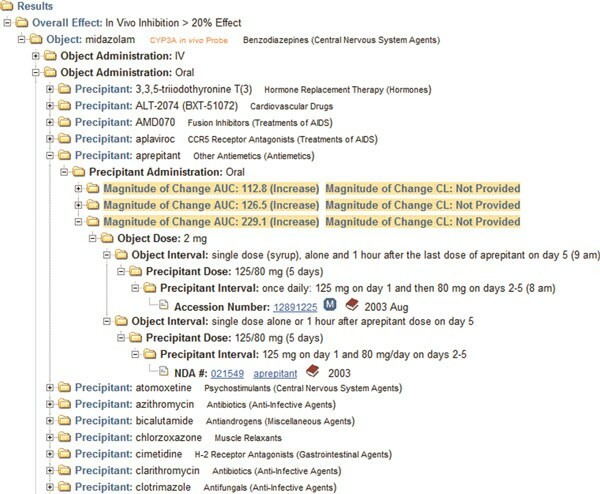 This section allows users to retrieve overall summaries on DDIs related not only to drugs used to treat the disease, but also to drugs used to treat the main co-morbidities of that disease. The DIDB search interface utilises a list of prestructured searches called 'queries'. These are set along intuitive themes such as drug, enzyme, therapeutic class, transporter, etc. and thus allow the user quickly to select the appropriate search without the need for extensive training (Figure 1). Ten sets of queries allow users to perform focused searches. 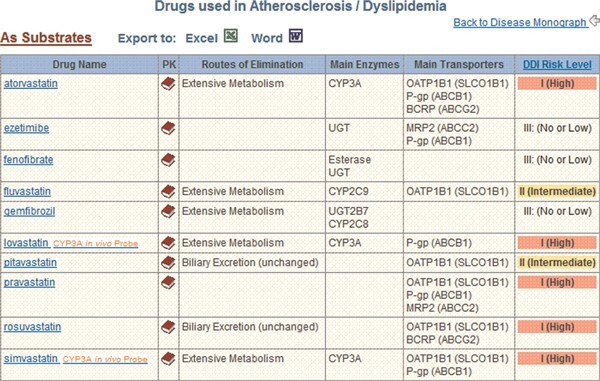 Display from the Metabolism and Transport Drug Interaction Database© (http://www.druginteractioninfo.org). Analysing and interpreting the result. In its last guidance document,  the US Food and Drug Administration (FDA) proposed that CYP3A inhibitors be classified based on the magnitude of change in plasma area under the curve (AUC) of oral midazolam or other sensitive CYP3A substrate. For instance, if the ratio AUCinhibited/AUCcontrol (AUCR) of oral midazolam (or other sensitive CYP3A substrate) is ≥ 5, the inhibitor is considered a strong CYP3A inhibitor. If the ratio is ≥ 2 ≤ 5, the inhibitor is classified as moderate and, finally, if the ratio is ≥ 1.25 ≤ 2, it is considered a weak inhibitor. A similar classification has been proposed for the other CYP enzymes. By using a clear and consistent categorisation of drugs as substrates and inhibitors, the FDA hopes to facilitate analyses across DDI studies and to help healthcare providers to administer these drugs safely through a consistent labelling language. In addition to the CYP3A probe substrate midazolam, the FDA provides a list of other sensitive CYP3A substrates (ie that exhibit an AUCR of ≥ 5 when given concomitantly with a CYP3A inhibitor). These sensitive substrates are: budesonide, buspirone, eplerenone, eletriptan, felodipine, fluticasone, lovastatin, midazolam, saquinavir, sildenafil, simvastatin, triazolam and vardenafil. Broad applicability of the above proposal rests on the assumption that the classification of a CYP3A inhibitor would be independent of the sensitive substrate used. In order to test the assumption of substrate independence, the DIDB was interrogated for: 1) a comprehensive list of sensitive substrates and 2) any discrepancies when classifying inhibitors with different sensitive substrates. The AUCR (ie AUCinhibited/AUCcontrol ) of substrates was used as the metric to assess the degree of interaction and to classify inhibitors. To obtain a comprehensive list of sensitive substrates, all inhibitors of midazolam were retrieved using the DIDB section 'AUC and CL Changes Queries' and the query 'Percent AUC with Object' (Figure 2). Query labelled 'Percent AUC or CL with object' used to find in vivo inhibitors of CYP3A4 using midazolam. Display from the Metabolism and Transport Drug Interaction Database© (http://www.druginteractioninfo.org). 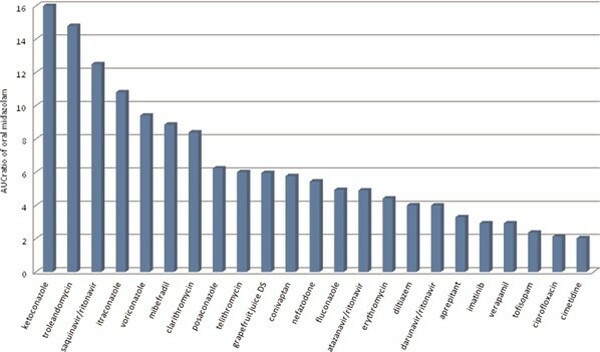 For midazolam as a substrate (ie object), the display shown in Figure 3 has an alphabetical list of 44 inhibitors which increase midazolam AUC by at least 20 per cent (in vivo cut-off to classify a study as positive). List of precipitants (inhibitors) evaluated with midazolam (partial view). These precipitants have increased the AUC of midazolam by 20 per cent or more. Display from the Metabolism and Transport Drug Interaction Database© (http://www.druginteractioninfo.org). 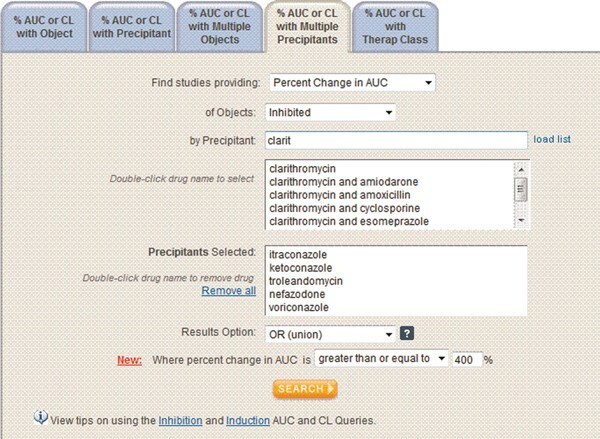 Each precipitant (inhibitor) in the list has its own folder containing more detailed information: the exact value of the AUC change observed in the study; dosing regimen of the object (substrate) and the precipitant (inhibitor); and a link to the source article identified by either an accession number (PMID number) or an NDA number. By clicking directly on this number, the full description of the article can be retrieved (study design, population, the drug's dosing regimen, results of pharmacokinetic measurements, side effects, etc.). Two additional features are available next to the accession/NDA number: abstract of the article (visualised with the icon) and reference PK parameters for drugs (retrieved by clicking on the icon). There are several options for displaying the results in a table and performing filter operations, as well as exporting capabilities into Microsoft Excel® or Microsoft Word®. When the list of inhibitors obtained with oral midazolam is exported into an Excel file (Figure 4) and the maximal increase is kept for each inhibitor, the following graphical display is easily obtained using potent and moderate inhibitors (Figure 5). 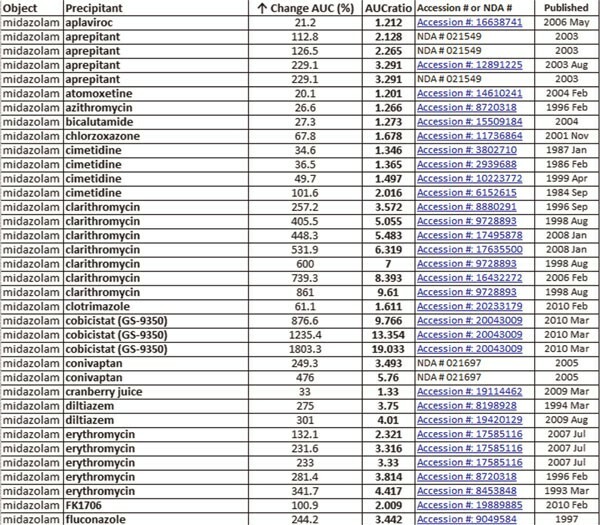 Excel download (partial view) of the results of the query that retrieved CYP3A4 inhibitors using midazolam (oral) as a substrate (same results as in Figure 3). Display from the Metabolism and Transport Drug Interaction Database© (http://www.druginteractioninfo.org). Potent and moderate CYP3A inhibitors and their effects (AUC R ) on the probe substrate midazolam. The obtained list of inhibitors (potent and moderate) will be then used in a different query, 'Percent AUC with multiple precipitants', to find substrates. Selecting a percentage change in substrates AUC of 400 per cent or more (ie AUCR ≥ 5) will narrow the results sets to sensitive substrates (Figure 6). Query labelled 'Percent AUC or CL with multiple precipitants' used to find in vivo CYP3A4-sensitive substrates (AUC R ≥ 5 or percentage change in AUC ≥ 400 per cent). Display from the Metabolism and Transport Drug Interaction Database© (http://www.druginteractioninfo.org). The 44 inhibitors for which there are available studies with midazolam yielded the 13 drugs identified in the FDA draft guidance as CYP3A-sensitive substrates (namely, budesonide, buspirone, eplerenone, eletriptan, felodipine, fluticasone, lovastatin, midazolam, saquinavir, sildenafil, simvastatin, triazolam, vardenafil) but also 20 new ones, as shown in Figure 7. Thirty-three sensitive CYP3A substrates identified in the DIDB. Drugs that are underlined were listed in the latest FDA draft guidance . The sensitive substrates are presented in three quadrants, based on their AUCR (# in brackets) when co-administered with a known CYP3A inhibitor. In order to test if the classification with midazolam is applicable to other sensitive substrates, the attributed potencies with midazolam and the newly identified sensitive substrates were compared. Only inhibitors tested with a comparable dose regimen were included in the analysis. Among the eight 'potent inhibitors' (exhibiting a substrate AUCR ≥ 5) (clarithromycin, itraconazole, ketoconazole, mibefradil, nefazodone, saquinavir, telithromycin and troleandomycin) and the five moderate inhibitors (exhibiting an AUCR ≥ 2 ≤ 5) (diltiazem, erythromycin, fluconazole, grapefruit juice and verapamil), the classification was maintained in 34 cases (83 per cent) and 31 cases (74 per cent), respectively; however, exceptions were observed and are listed in Table 2. These discrepancies do not invalidate the proposed classification. Some of these differences could arise simply because of the absolute boundaries (2.0- and 5.0-fold) of the classification; some discrepancies could also be related to: (i) transporter effects in specific substrate-inhibitor pairs; (ii) intrinsic differences among substrates in sensitivity to inhibition (including fraction metabolised by CYP3A and intestinal metabolism); and/or (iii) inhibition of minor enzymes by CYP3A inhibitors . Similar findings have recently been reported by other groups [8, 9]. These differences in in vivo sensitivities of CYP3A substrates need to be considered when selecting a CYP3A probe substrate for clinical DDI studies. Assessment of the DDI risk potential of a new molecular entity (NME) during drug development takes into consideration the clinical outcome of administration of the NME and focuses not only on the drugs used to treat the primary disease, but also on those used to treat co-morbidities. Moreover, questions arise regarding the roles of environmental factors (food, herbal medications) and patient characteristics (genotype, age, etc.) that may also alter drug disposition. In the problem at hand, an NME is being developed for the treatment of hypertension. This NME is mainly metabolised by CYP2D6, with some contribution from CYP3A4. It was also found that this NME is a moderate CYP3A4 inhibitor, yielding an AUC ratio of midazolam of 3.2. Because hypertension is a condition that often co-exists with hyperlipidaemia, the developer wanted to evaluate whether drugs that treat this condition would have any clinically relevant impact on the disposition of this new antihypertensive drug; in addition, given the inhibitory profile of this NME, the user wanted to determine whether any drugs used in hyperlipidaemia were likely to be affected by this new antihypertensive. Within the DIDB website, the disease monograph for dyslipidaemia will be used (Figure 8). This monograph has been compiled using in-depth analyses of the metabolic profiles and effects of all compounds used in the treatment of dyslipidaemia (cholesterol absorption inhibitors, 3-hydroxy-3-methylglutaryl-CoA reductase inhibitors -- statins -- and fibric acid derivatives). The atherosclerosis/dyslipidaemia monograph is organised into summaries, ten individual drug monographs and two specific queries. One-page presentation of the different sections (summaries, individual drug monographs and queries) within the monograph for atherosclerosis/dyslipidaemia. Display from the Metabolism and Transport Drug Interaction Database© (http://www.druginteractioninfo.org). 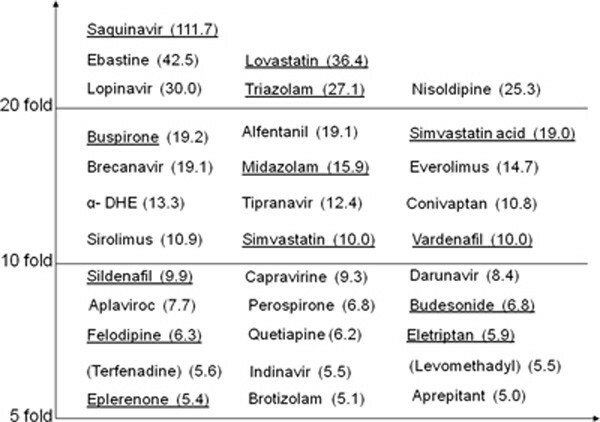 For all the drugs considered within the three subclasses cited above, complete profiles are presented within a table that highlights the main characteristics of each drug considered as an inhibitor/inducer (Figure 9). Complete DDI profile of ten antilipaemics presented within a table that highlights the main characteristics of each drug considered as an inhibitor or an inducer. Display from the Metabolism and Transport Drug Interaction Database© (http://www.druginteractioninfo.org). For each compound shown in Figure 9, the table provides the enzymes and/or transporters affected and a corresponding DDI risk level. Four risk levels have been created based on a combination of the following characteristics: (i) sensitivity to inhibition and induction of the involved enzymes and/or transporters; (ii) therapeutic range; (iii) documented clinical interactions. The inhibitory profiles of the ten antilipaemics listed in Figure 9 show that most of these drugs do not exhibit any risk of increasing the exposure of co-administered drugs. Only one compound, gemfibrozil, exhibits a relatively high inhibitory risk potential towards CYP2C8 and OATP1B1. None of the drugs are expected to alter the disposition of CYP2D6 substrates such as the NME. To address the CYP3A inhibitory potential of the NME and assess whether its weak inhibitory potency might affect certain antilipaemics, the overall view that highlights the main characteristics of all antilipaemics as substrates is used (Figure 10). Complete DDI profile of antilipaemics presented within a table that highlights the main characteristics of each drug considered as a substrate. Display from the Metabolism and Transport Drug Interaction Database© (http://www.druginteractioninfo.org). The table in Figure 10 shows that three statins (atorvastatin, simvastatin and lovastatin) are extensively metabolised by CYP3A4. An analysis of the DDI profiles of these three statins (Figure 11) shows that they are susceptible to CYP3A inhibition, as indicated by 3.3-, 15- and tenfold increases in AUC for atorvastain, lovastatin and simvastatin, respectively, in the presence of the potent CYP3A inhibitor itraconazole (the three drugs are also sensitive to potent inducers). Moreover, a search of the database shows that concomitant administration of the calcium channel blockers diltiazem and verapamil, known as moderate inhibitors of CYP3A, also increase significantly the exposure of atorvastatin, lovastatin and simvastatin (1.5- to fivefold) and lead to muscle toxicity. Based on these observations, a moderate CYP3A inhibitor, such as the NME under consideration, is expected to have a similar effect to diltiazem or verapamil on the exposure of the three statins, and dosage adjustment may be required for these drugs when co-prescribed with the NME. 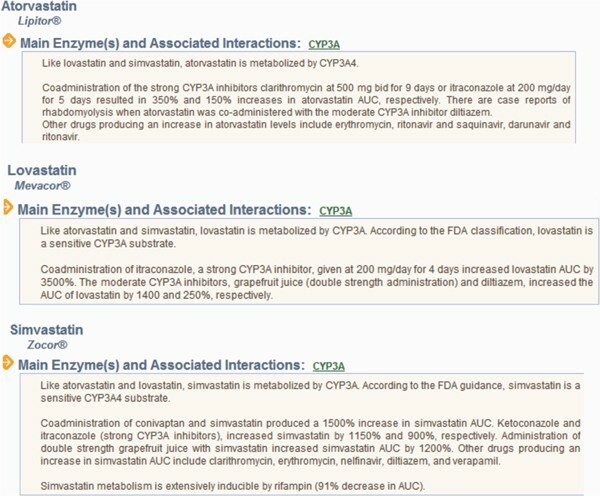 Example of the drug monograph section called ' Main enzymes and associated interactions ' for three statins that are CYP3A substrates: atorvastatin, lovastatin and simvastatin. 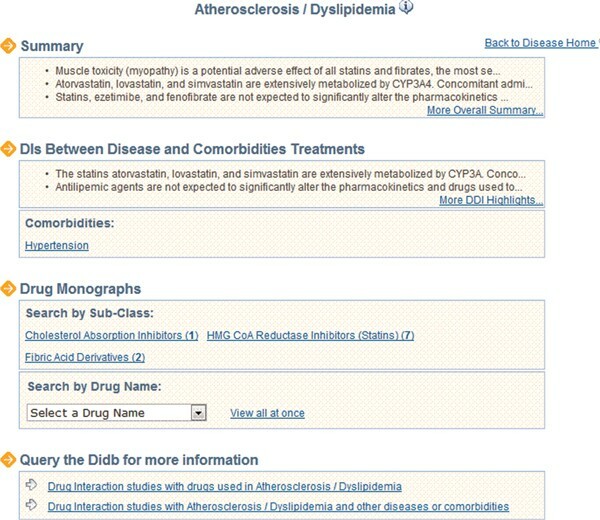 Display from the Metabolism and Transport Drug Interaction Database© (http://www.druginteractioninfo.org). The new disease section has multiple uses and it allows a rapid assessment of the DDI potential of an NME in comparison with other marketed drugs used to treat the same disease, and also the DDI potential of this NME with drugs used to treat co-morbidities of that disease. Additionally, the complete DDI profile of a disease is provided in summarised tabulated views. Clinical investigators may also be interested in using two specific queries that yield the DDI profile resulting from the coexistence of any two diseases of interest (eg hypertension and diabetes) (Figure 12). Query labelled ' Two diseases or comorbidities ' used to retrieve all DI studies between antihypertensives and antidiabetics. Display from the Metabolism and Transport Drug Interaction Database© (http://www.druginteractioninfo.org). For almost a decade, the DIDB has been widely used by scientists and clinicians working in the field of DDI. The tool is constantly being optimised as a result of feedback from a large base of users, including requests for specific searches. These can be in the form of new queries or special reports tailored by the DIDB team. New features currently being developed include the addition of datasets pertaining to emerging areas (therapeutic proteins, pharmacogenomics). The DIDB is also enhanced with tools that allow users to focus rapidly on important DDI reports and sort through the large body of literature. Examples of such tools include: graphical displays of the extent of DDI (AUCR, changes in the clearance of substrates) and 'flagging' important drug characteristics (narrow therapeutic range drugs, probe substrates, potent inhibitors or inducers).